How long does it take from the time my order is placed until I can pick it up? We make every effort to have orders ready for pickup 48 hours after the order has been placed, however the time to assemble an order varies depending on the items purchased. Some items may still be growing in the ground and need to be dug which may extend the time it takes to completely fill the order. You will be notified via email once your order is ready for pickup. Please do not arrive to pick up your order until you have received this email. All orders can be picked up from our Nursery at 8601 Snider Road in Mason, Ohio. Orders are assembled and placed in one of several holding areas depending on the time of year and type of plant. You will receive an email when your order is ready with specific directions as to where to go to pick up your order. Please follow the directions’ on the email for your specific order as pick up locations will change depending on the season. You will receive an email when your order is ready with specific days and times when you can pick up your order. Please follow the directions’ on the email for your specific order as pick up times change depending on the season. If for some reason you are unable to pick your order during the times specified, please contact us and we can work with you to arrange an alternate time. Your order needs to be picked up within 5 days from the time you received this email. Why are some plants listed as “Available soon” and can I buy them? We list plants that we have in production as “available soon” with a projected ready date. This is to let you know what we have coming in the future, but it is for informational purposes only. only items that are currently ready and in stock can be purchased. Why are some plants listed that are not “In Stock” or “Available Soon”? These plants are plants we have grown or had available but currently do not have in inventory and do not have new crops available within the next 3 months. These plants are listed for informational purposes only. Can I buy hard-goods online (Fertilizers, soils, pottery, etc.)? Currently we only offer plants for sale online. Hard-good purchases must be made at the Nursery Outlet. This is a feature we will add in the future. Can I use a Natorp Gift Card for my online purchases? Currently we do not accept gift cards for online purchases. This is a feature we will add in the future. To use a gift card purchases must be made at the Nursery Outlet. Can I use coupons for my online purchases? Currently we do not allow the use of coupons for online purchases. This is a feature we will add in the future. 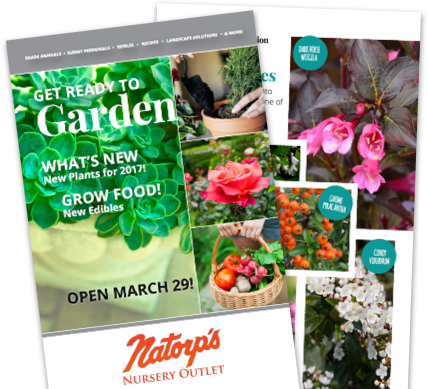 To use coupons purchases must be made at the Nursery Outlet. Can I have my online purchases delivered or planted? What happens if I do not like the plants that were selected for me? If at the time of pick up you are unhappy with any of the plants we would be happy to swap them out with plants of your choice from our inventory. If for some reason you cannot find a plant that satisfies your need you will receive a full credit.